While Paris was slowly thawing from the most snowfall it had seen in some 30 years, Focus Home Interactive was busy showing PlayStation LifeStyle and other selected media guests their latest upcoming video games. Developer Spiders Games was on-hand to show us their upcoming fantasy action RPG, GreedFall. It’s certainly a title players should keep an eye on. 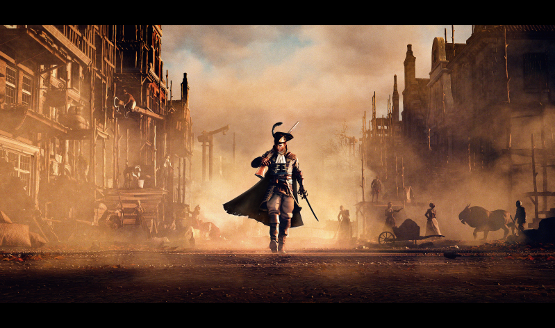 GreedFall features a setting inspired by Baroque art from 17th century Europe. Settlers have descended upon a mystical island. One that’s protected by numerous species from nimble hominid-like species to massive guardian beasts. The meeting of vastly different cultures results in high tensions, something shown quickly in just a few cinematics. It’s immediately obvious that the world of GreedFall is a colorful one, as we were presented with a lush forest, with bright green hues and iridescent foliage set as the backdrop to violent war. Always nice to see a vibrant palette. Spiders Games made it clear that they are giving players many choices throughout the adventure in GreedFall. This means that decisions will impact the storyline, also resulting in different endings. As a settler, the player can choose to attempt to conquer the mystical natives, help them keep their sovereignty, or something entirely different. Taking over or helping the world takes more than just one person, so GreedFall features squad-inspired gameplay. Five companions can join the player on any given adventure. Their loadouts can be changed manually, as well. It wasn’t immediately obvious just how autonomous these companions are during battle, but they did seem to hold their own during the demo that was shown. Fundamentally, the combat shown resembled a typical brawler, though the dual-wielding of traditional weapons and magical abilities are likely to ensure variety. Animations were a bit stiff, but the game is still in active development. Multiple enemies could be taken on by flicking the right analog stick to target them one at a time. So causing one enemy to stumble back, to give the player room to attack another, is in the realm of possible tactics to use when on the battlefield. A short, special move also slowed down time for a moment. This was done for the sake of slowing the action if it gets too overwhelming, since combat is designed to be challenging. Attacks will vary in range and damage, though no onscreen damage indicators could be seen in the build shown. While it wasn’t shown, there is a crafting system in GreedFall. It’s likely resource-based, and will allow the player to craft things they might need to heal, buff, or to solve other traditional RPG needs. There are also over 100 skills to choose from, varying from science, to exploration, and social skills. GreedFall looks ambitious, and different enough that it should find an audience whenever it does launch (a release date is not currently set at the time of this writing). Multiple factions to be concerned with should hopefully translate into a nuanced experience, all taking place in a world that thankfully has a wide palette featuring colors other than brown and gray. With any luck, GreedFall will launch later in 2018. PlayStation LifeStyle would like to thank Spiders Games and Focus Home Interactive for taking time to show us GreedFall. Watch this space for more updates from the Le What’s Next de Focus event soon!